First Nations children and families living on reserve and in the Territories receive public services funded by the federal government. Since confederation, these services have fallen significantly short of what other Canadians receive. This injustice needs to end and Spirit Bear's Plan will do just that. CANADA to immediately comply with all rulings by the Canadian Human Rights Tribunal ordering it to immediately cease its discriminatory funding of First Nations child and family services. The order further requires Canada to fully and properly implement Jordan's Principle (www.jordansprinciple.ca). PARLIAMENT to ask the Parliamentary Budget Officer to publicly cost out the shortfalls in all federally funded public services provided to First Nations children, youth and families (education, health, water, child welfare, etc.) and propose solutions to fix it. 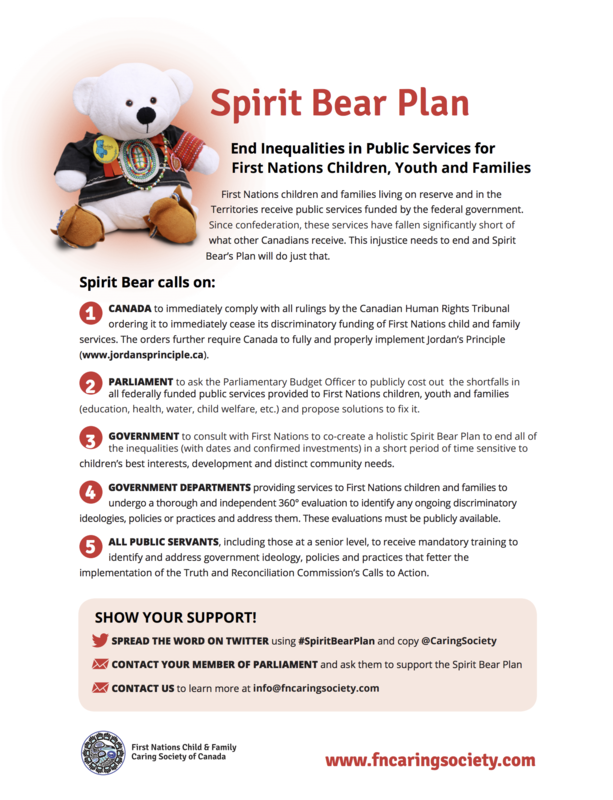 GOVERNMENT to consult with First Nations to co-create a holistic Spirit Bear Plan to end all of the inequalities (with dates and confirmed investments) in a short period of time sensitive to children's best interests, development and distinct community needs. GOVERNMENT DEPARTMENTS providing services to First Nations children and families to undergo a thorough and independent 360° evaluation to identify any ongoing discriminatory ideologies, policies or practices and address them. These evaluation must be publicly available. ALL PUBLIC SERVANTS including those at a senior level, to receive mandatory training to identify and address government ideology, policies and practices that fetter the implementation of the Truth and Reconciliation Commission's Calls to Action.